A cutting-edge building for more than 350 workplaces was opened at the Alte Schlachthof in Karlsruhe: the largest office building in Baden-Wuerttemberg to be certified to the passive house standard. All aspects that today’s tenants want in a modern office building have been taken into account – comfort, good acoustics and daylight. The spaces can be adapted to individual requirements with flexibility. “Around 90 percent lower heating costs compared to conventional buildings, high indoor air quality and maximum flexibility in terms of space are facts that speak for themselves,” says Thomas Burkard, partner and managing director at Vollack bauInvest, summing up the highlights. 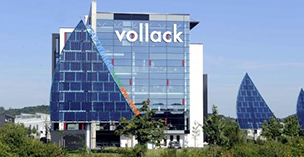 “We combine high design and planning standards with sustainability and economic efficiency,” explains Thorsten von Killisch-Horn, partner and managing director at Vollack Karlsruhe. The concept reflects the significance of the site. The warm colored metal facade mirrors the historical earth tones of the local region, while façade greening contrast with the sealed surfaces of the grounds. The IT company Citrix uses connected loft offices with an area of 4,000 square meters. “Not even the sites in San Francisco, Santa Barbara or London are as modern,” says Andreas Heinkel, Senior Manager of Real Estate & Facilities EMEA at Citrix. The software development specialists of the GRENKE Group work in office space with a total area of 1,700 square meters. The ground-floor tenants are daten & druck dannenmaier, the printing experts, and kymo, the contemporary floorwear brand. Carls Wirtshaus ensures culinary creativity by offering a wide variety of beers as well as regional cuisine with international influences.